The Honor 8X is all set to become the Huawei sub-brand’s latest mid-range smartphone, when it launches in India on October 16. The successor to the last year’s Honor 7X, the new Honor 8X also has dual rear cameras, but with a refreshed vertical alignment. The new phone also uses Huawei’s latest in-house SoC, the octa-core HiSilicon Kirin 710. 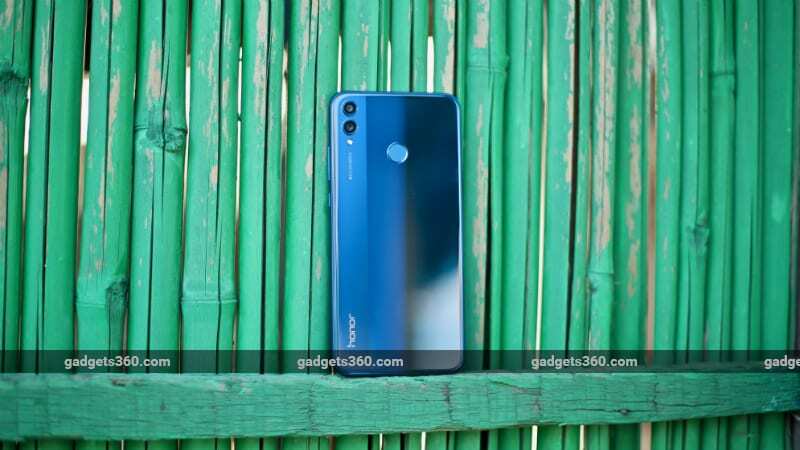 Honor India claims that the smartphone will take on the likes of the Xiaomi Redmi Note 5 Pro and Nokia 6.1 Plus, which leads us to believe the Honor 8X price in India will be between Rs. 15,000 and Rs. 20,000. The Honor 8X will find itself in a market segment that is currently flooded with value-for-money options from manufacturers including Xiaomi, Asus, Motorola, and Nokia. However, with its premium design and software enhancements, can the Honor 8X offer a unique value proposition to customers this festive season? We got to spend some time with the Honor 8X at the a pre-launch briefing session, and here are our first impressions. Right out of the box, the Honor 8X feels extremely solid and premium. Based solely on design, it does not look like a phone priced below Rs. 20,000. The back of the Honor 8X has a dual-tone colour scheme which the company says is an evolution of the Honor 10’s rear gradient design. On the front is a massive 6.5-inch IPS LCD with a resolution of 1080x2340 pixels, an aspect ratio of 19.5:9, and a pixel density of 397ppi. Much like other current Honor smartphones, there is a notch, but it looks relatively small in proportion to the large display. One interesting feature of the Honor 8X is that this display has a minimum brightness of just 2 nits, which should make it extremely comfortable to use in the dark. Compared to other Honor phones such as the Honor 9N and the Honor Play, the Honor 8X has a relatively thin bottom chin. There are no capacitive or physical buttons; you get to choose between onscreen keys and EMUI’s gestures. The left of the smartphone has the SIM tray, which has two Nano-SIM slots and a dedicated microSD card slot. On the right, there’s the lock/ power button and the volume control keys. On the bottom, you’ll find a loudspeaker, a 3.5mm headphone jack, the primary microphone, and, disappointingly, a Micro-USB port. An Honor representative told Gadgets 360 that the company made the decision not to go for USB Type-C based on cost. The secondary microphone is placed on the top. On the back, you get to see the vertically stacked dual camera setup that consists of a 20-megapixel primary sensor and a 2-megapixel depth sensor, both with f/1.8 apertures. The single selfie camera has a 16-megapixel sensor with an f/2.0 aperture. As with previous models, the Honor 8X has AI enhancements for both the rear and front cameras. Users can turn off the AI features when shooting if they prefer. We had a very short amount of time with a demo unit of the Honor 8X, and under favourable indoor light, it seemed to take sharp close-up and wide-angle images. For much more extensive tests of this phone’s cameras in many different conditions, do stay tuned for our upcoming review. In terms of security, you get a rear-mounted fingerprint sensor and software-based face recognition. The fingerprint sensor was largely accurate and quick in our initial experience. Even the Face Unlock feature was quite snappy, although it might have difficulties in low light. Honor has implemented a nifty feature that increases the brightness of the screen in the dark to help the phone get a clear shot of your face. We will reserve our final judgement for the Honor 8X in our full review, coming up soon. At its core, the Honor 8X is powered by Huawei’s latest HiSilicon Kirin 710F, which has a dedicated NPU (Neural Processing Unit). The company claims to deliver hardware-based device-level smart AI features. The Honor 8X will be the first smartphone in the Indian market with this SoC, and Honor tells us that it offers better performance than even Qualcomm’s Snapdragon 660 SoC. The phone will be available in three variants — one with 4GB of RAM and 64GB of storage; one with 6GB of RAM and 64GB of storage; and then a top-end variant with 6GB of RAM and 128GB of storage. The smartphone also features a 3,750mAh battery, and supports charging at 5V/2A (10W). The bundled charger will deliver this much power. Honor India claims that although quick charging is capped at 10W, software enhancements can actually boost charging speed. We will have to test that very interesting claim in our Honor 8X review, in which we will also conduct battery loop tests and also examine this phone’s real-world battery performance. The Honor 8X runs Huawei’s custom EMUI 8.2 on top of Android 8.1 Oreo. While there is no official timeline, Honor says an Android Pie update will come soon. As noted in the case of the Honor Play, the company has been gradually reducing the the number of preloaded apps on its phones. We could spot only a few apps, including Facebook, Facebook Messenger, Netflix, Camera360, and a game called Lords Mobile. However, there are several of Honor’s own apps and features such as Phone Manager, HiCare, AppGallery, Health, Honor Club, Ride Mode, and Party Mode. Obviously, like all other Android smartphones, there are several Google apps including Gmail, Google Maps, YouTube, Google Drive, and Google Photos as well. Based on our first impressions, the UI seemed quite smooth. The Honor 8X also features the company’s GPU Turbo feature out-of-the-box, but gaming performance can be expected to be less impressive than that of the Honor Play. Honor claims that users can run PUBG smoothly at medium settings on its latest mid-range phone, and of course we will test that too. product We got to spend some time with the Honor 8X at a pre-launch briefing, and here are our first impressions. Honor 8X price in India will be revealed next week.